Today robots are mainstream in manufacturing and ACT works with our customers to design, engineer and fabricate automated conveyor parts washer systems that focus on increasing ROI, improving robot material handling and reducing manual workloads. One of the simplest forms of robotic material handling is the employment of pick and place grippers to secure a part, placing it exactly where it needs to reside for pinpoint delivery of modern aqueous cleaning solutions. Factory operation delivers parts with high speed and throughput rates, yet these “fragile” parts cannot be simply batch processed as the risk to machined surfaces is too great. Our automated conveyor parts washer systems are engineered to take into account the complex internal geometry of parts, and the loose soils and even chips that can remain on them. 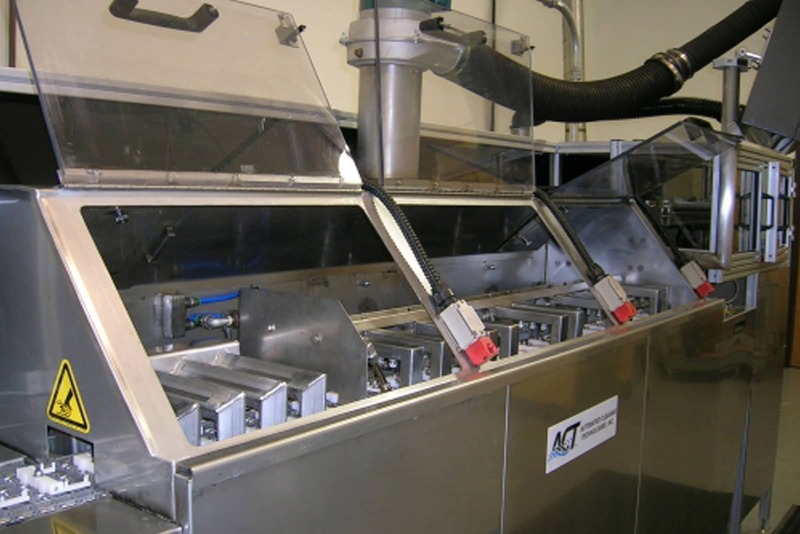 Produced with cutting edge engineering and fabrication capabilities, our automated conveyor parts washer systems use advanced directed flow patterns, custom programming and robot material handling methods to clean the most difficult parts across numerous stages without damaging them. We develop robotic work station design and turnkey cells that are fully integrated, pre-configured solutions for even the most complex cleaning or processing systems. Our custom programming can integrate with the latest industrial process and robot material handling management systems. Using Allen-Bradley, IDEC, National Instruments, Eaton, Schneider, Siemens, ABB and other industry proven technologies, we can create user-friendly programming and HMI displays that can be viewed and controlled via internet gateway from anywhere in the world. ACT’s experience with robotic pick and place grippers and robot material handling parts washer systems goes back over 20 years and in recent years we have expanded our integration of larger robots to clean heavier parts with multiple axis control. Contact an ACT sales engineer to discuss how we can develop and deliver a pick and place robotic system to meet your operational requirements.